There hasn’t been any sewing here for a few days because we traveled to see the solar eclipse. Yes, it was too brief, but it was amazing and we had a wonderful time. Due to my DH’s good planning, we avoided the crowds and most of the traffic, and it was fun to be part of the pilgrimage. Our hotel in Owensboro, KY, passed out glasses, Moon Pies, and Sun Drop soda, and we enjoyed the very beautiful Riverwalk. Then we traveled to Elkton, KY, which made us welcome on their small courthouse square. There we spent hours with about two hundred people from several states and countries in a very festive gathering that really added to the enjoyment. A shout-out to the kind Courthouse ladies who welcomed us and even had an emergency repair made to their restroom so we could all be more comfortable! 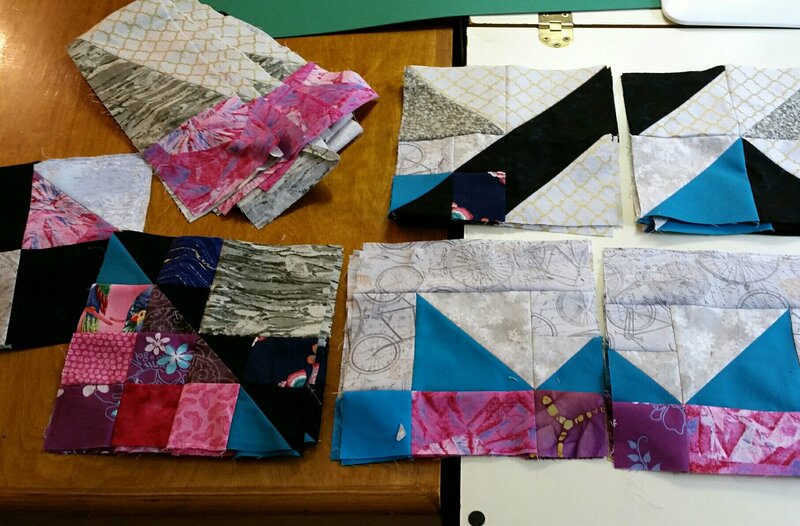 Last week, though, I finally got down to it, and made the four paper-pieced blocks for Layer Cake Explosion by Angela Gross (find the pattern on Craftsy). It has been a while since I paper-pieced, and I will admit to flipping and fussing for a while until I got the hang of it again. 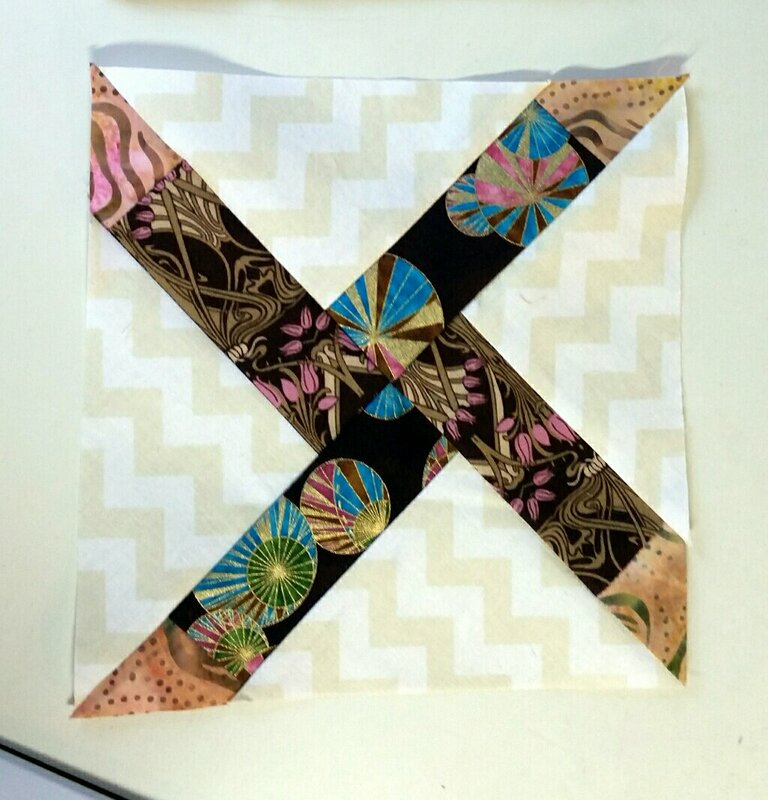 I’m not really sure why this block is paper-pieced, and I almost just sewed it conventionally, but I decided it would be good practice. 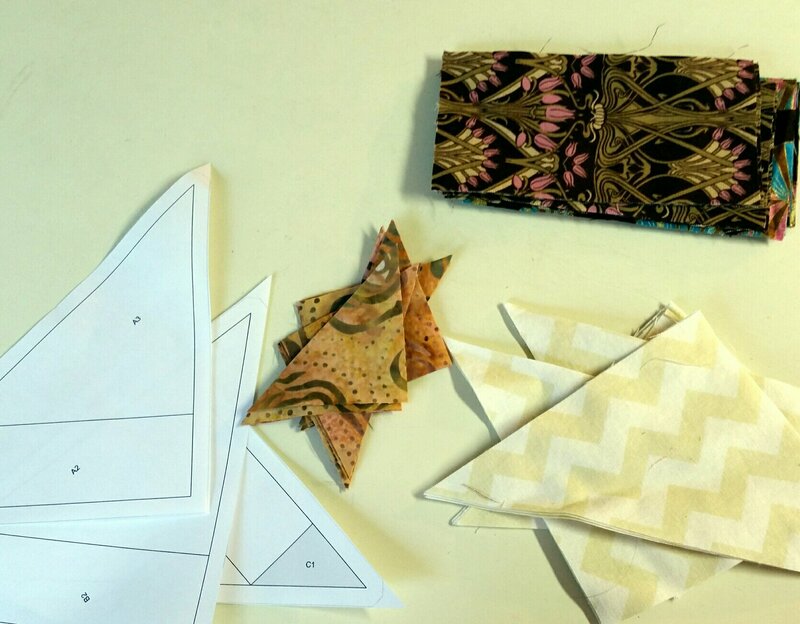 I pre-cut my fabric shapes and it went together easily once I got my head around it. I chain-pieced the sixteen sections, and it went quickly. This is not the final layout, but it’s getting closer. 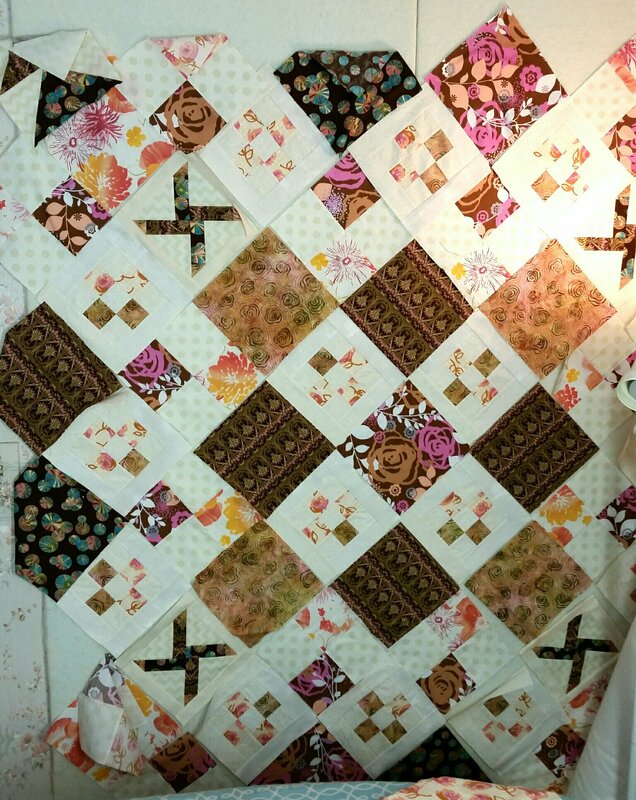 I still have to cut sashing strips and setting triangles. And I need a bigger design wall! I’m sorry if you’re getting wacked with wind and rain, but this cool front has brought me delightful sewing weather and I hope to make some progress. Hope you do, too! Categories: Uncategorized | Tags: Evening in the Garden, layer cake explosion, Valerie Root | Permalink. These past two weeks haven’t seen much sewing, but I did complete these wall hangings from printed panels. This picture was taken before they were washed and dried. We were talking over on Twilters! about whether or not to wash them. 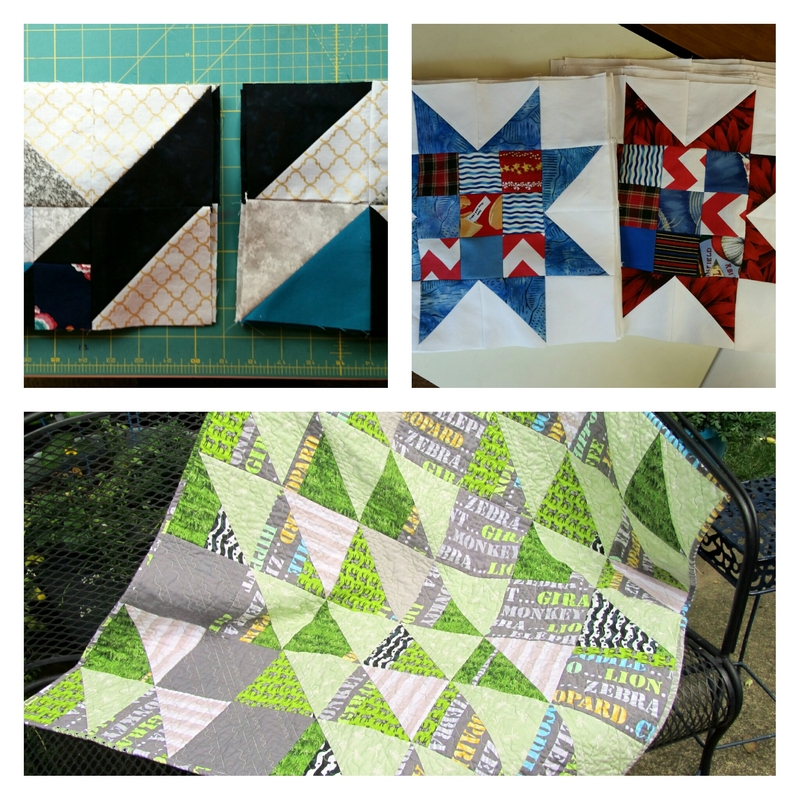 Often I don’t, if I didn’t use marking on them for the quilting. 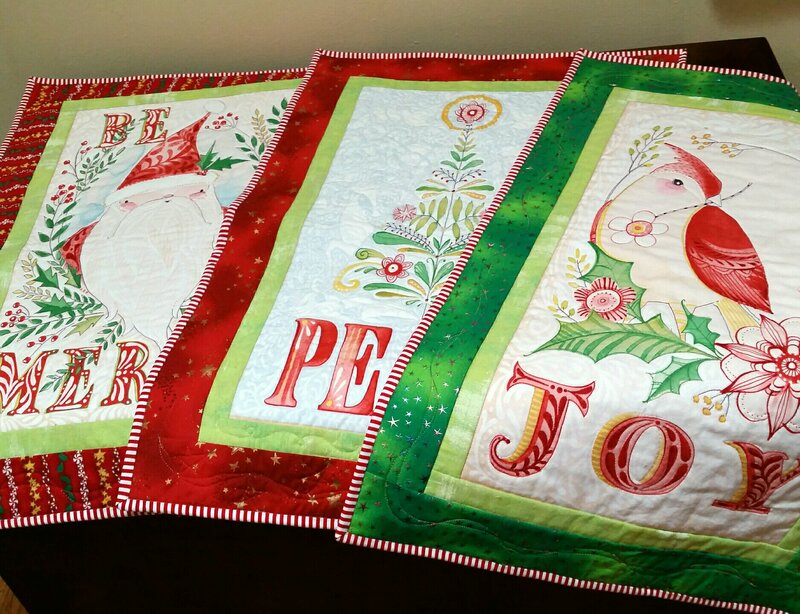 This time they seemed very flat and the invisible thread quilting didn’t show up much. I like them much better now that they’re poofier. Also, I caught up on the current clue (lower right blocks) for the Pacific Stars mystery by Charlotte Scott. These won’t count out of the stash until the quilt is completed.